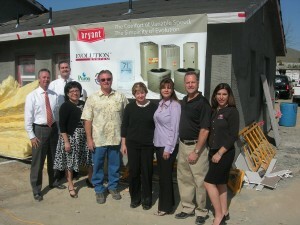 Habitat Bryant McLay McLay Services, Inc., a residential and commercial contracting firm from La Verne, California has donated two Bryant air conditioning systems to the Habitat for Humanity and the YWCA. The Habitat for Humanity has partnered with the YWCA to build the “Born Free” Residential Treatment Facility. The goal of the program is to assure babies are “Born Free” of drugs. Drug addicted babies suffer from severe medical difficulties. Many are born prematurely, some are disabled, and others have significant learning difficulties. The cost to the state is enormous, over $1 Million during the baby’s lifetime; even more horrendous is the cost to the babies who will have difficulties throughout the rest of their lives. The YWCA’s unique “Born Free” Program is a residential treatment home that houses chemically dependent women so that they can recover from addiction, and most importantly, give birth to healthy babies. The women also learn life skills to become healthy, self-sustaining members of society. The licensed 24 hour residential treatment program provides food, shelter, transportation, counseling, infant care classes, and other supportive services. McLay Services, Inc. donated the Bryant 13 Seer Legacy Air Conditioning Systems with Puron Refrigerant. The Bryant Systems are energy efficient and environmentally friendly. McLay Services, Inc. and Habitat for Humanity are committed to building energy efficient homes and using building materials that cause the least damage to the environment. “We were happy to donate to Habitat for Humanity. When we learned the recipient of the home was the YWCA and their program was for babies to be “Born Free” of drug addiction, we were even more delighted to be a part of it! It’s a Triple Bonus – three worthy causes! It supports Habitat for Humanity, teaches women the skills necessary to become healthy, successful members of society, and most importantly; assures babies are Born Drug Free! HOW GREAT IS THAT!! !”, says Talva McLay, Vice President of McLay Services. “Born Free” is a partnership that benefits the mother, baby, and the entire community. Since the program launched in 1990, more than 200 babies have been “BORN FREE” OF DRUG ADDICTION. The savings to the community is substantial; but more importantly, it has given the babies a chance for a normal life.